My best friend, Justine, from Southern California visited me a week before my big move to the Southwest. Initially, we planned a trip to visit Yosemite National Park. Few days before the trip and as the group grew smaller, we discovered it's going to snow there all weekend. Last minute plan B, it is! Knowing Sequoia National Park is only an hour away from where I live, we figured to just give it a whirl. We checked the weather app, and although there is no snow, it's going to rain all weekend. No matter how much you plan, things go differently as planned occasionally. Weather is such a big factor to plan along the way, and it's going to slow things down. Thanks to her, she still encouraged me to go. I would have been at home still stressing about all the packing I need to do for my move. A change of scenery is always good for the spirits, so, Justine and I made our first trip to the sierras together. And guess what? Our spontaneous trip became one of the most memorable ones. Reminds me of the show Naked And Afraid. This tipi is right by the entrance to the Sherman Trail. We discovered this wonderful view with a rope swing behind the Gateway Restaurant at Three Rivers, CA. Sequoia National Park is about 150 miles away from Yosemite National Park. It is where the largest tree on Earth, General Sherman and 4 other largest trees on the planet. Many people from around the world come to see this tree. It was quite impressive especially for a nature-lover like I do. Snapping photos and attempting to capture the size of the trees while raining was a challenge. The vast majority of the park is a wilderness of rustic beauty and the drive is beyond your road trip dreams. My bff, Justine. We got the sign all to ourselves around 4 pm. Sherman Trail - an easy flat trail to see the world's largest tree. 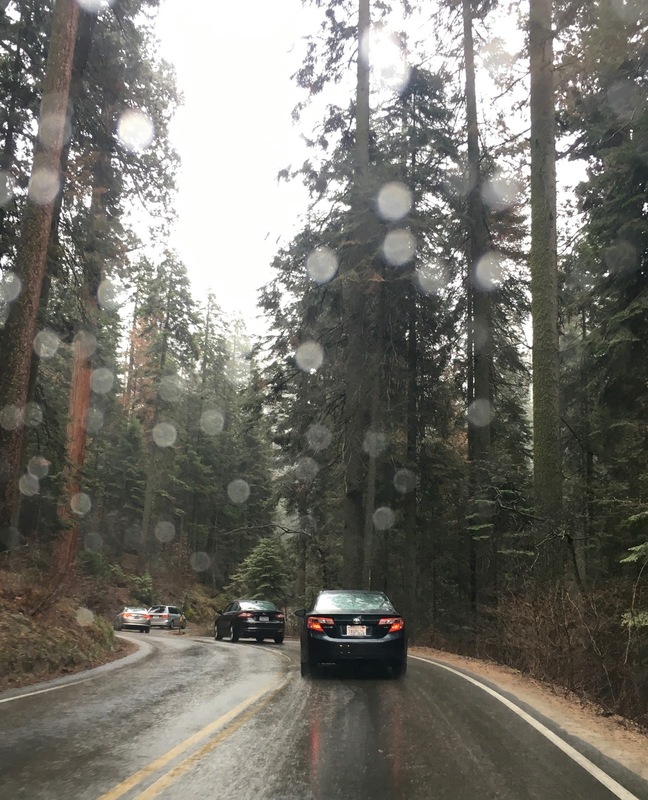 Driving through the roads of the Giant Forest - where we saw endless, rolling fields of golden green grass, redwood trees and pine-covered mountains. As we drive further up, the mountains are then covered with clouds and fog. We definitely enjoyed the scenic views while driving up and down the switchback roads. We stopped by the side of the road to appreciate this beauty. Two sequoia trees called Tough Twins. My view from the ground up of the world's largest tree - General Sherman. We got to experience 2 seasons in one day in Sequoia: humid sunny and foggy rainy. Scenic national parks have always attracted visitors in any weather. Just the thrill of discovering a new trail, seeing the beautiful trees and its natural habitat, and summiting a mountain to see soaring views above and below all keep us coming back for more. It gives us a clearer perspective of our place in this world, a feeling of smallness and vastness wrapped into one. One of the many zigzag/switchback roads in Sequoia NP. The driving situation to and from the forest. We rounded out the day with amazement and lots of stories to tell each other and our friends. It was another wonderful day in another wonderful paradise. It is clear that we didn't have enough time to see and visit everything, but we've already seen more than what we had hoped for. But as always, there is a strong desire to return and see more. Till next time, Central California.